When brewing, what is your average batch size? A couple months back my friend Tracy Jill dragged me to a cocktail night at Bar Pilar here in DC. It was the last night on the job for their weekly mix-master and he was bringing back his favorites from his time there. The bar had a couple decent taps, but I decided to take in the Epicurean delights (at $11 a drink). Most of cocktails on the menu were riffs on old classics, or interesting new combinations, many with homemade bitters and other exotic ingredients and liquors. I thought most of them were alright, but I have not not had many cocktails since discovering good beer, they either end up too sweet or too boozy for my tastes. The one standout I tried was based on (surprise) Allagash White, with Plymouth gin, orange juice, honey syrup, and some lemon peel. The flavor was great, wheaty/bready, with some spice and just a touch of sweetness and not a lot of ethanol. Fast forward a couple of weeks and I was in The Wine Specialist on M St buying some beer (while walking back from $4 happy hour glasses of BFM Abbaye De Saint Bon Chien at Pizzeria Paradiso). As I was walking out a clear square bottle with the Hitachino's Nest owl on the cap caught my eye in the sake display. It was called Kiuchi No Shizuku and the label indicated that inside was the distilled remains of Hitachino Nest Wit beer (aged with extra aromatics), it sounded worth $15 for a try. The aroma was not too bad (orange and coriander and maybe a hint of herbal hops), but at 86 proof the alcohol was too strong for my tongue to get past. 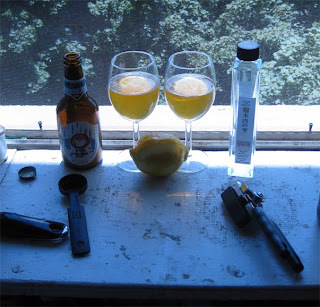 Then an idea struck me, why not soften the harsh edges of the distilled spirit with some of the beer it was distilled from, plus a bit of lemon peel to give it a fresh citrus pop. I added a tablespoon of the liquor to each half of the beer (guessing completely on what to aim for). The results were pretty good, the flavor was close to an imperial wit. I think the beer was a bit past its prime, but the fresh citrus peel helped to cover that up. Although not as good as the original blend at Bar Pilar I thought it was a reasonable first attempt. A small amount of honey and orange juice would help to replace some of the sweetness that a bigger beer normally has, as well as some added complexity. 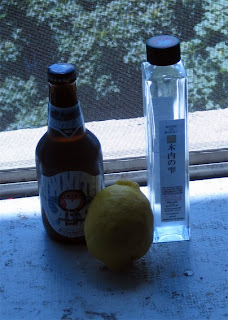 I realize most of you won’t be able to try this exact concoction at home, but gin is along the same lines as Kiuchi No Shizuku (they are both distilled spirits with herbs and orange peel), and any wit will do. Nothing wrong with playing with your beer a little bit from time to time. Does anyone else have a good beer cocktail recipe to share? The pictures on your site are really great. I haven't the skill to take nice pictures, but I would like to learn. What camera do you use? I love stopping in every so often to see the wild stuff you've been fermenting. Keep up the creativity! Inspired by a Randy Mosher column I'd read, one winter I found myself enjoying a beer nog or two – a rich malty beer plus egg nog mix plus a liquor like rum or bourbon. 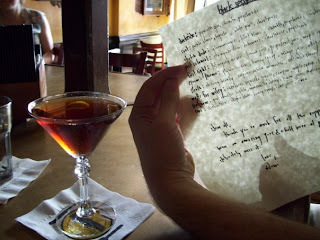 Thanks for including the link to Bar Pilar. I looked at their menu and it looks great--and they have a dark beer on tap besides Guiness! The menu reminds me of one of my favorite restaurants in Portland. Ha! Knew you were probably a birreria hh regular. I'll try to spot you and raise a toast sometime. I have a PowerShot SD770IS, good lighting is the key to getting great shots (I actually didn't love the ones on this post, so glad you liked them). I'll have to try some beer nog once the weather cools down a bit, sounds like a good alternative to the "standard" holiday drinks. That was my first and only visit to Bar Pilar, but I will certainly go back at some point. Paradiso is great, but the lack of metro in Georgetown means I get there less frequently than I would like. I'll certainly be a real regular when they have the new beer-ier one up and running by Dupont. I plan to pull double duty once Dupont 2.0 opens. I may see you there, too. had a refreshing beer cocktail the other night at a wine bar in San Francisco (Uva Enoteca) across the street from the toronado, in fact. It was a Marzen base with hibiscus, cardamon(I think? ), dubonnet & lime. Refreshing and delicious. The beer flavor wasn't overpowering but provided a great base for the cocktail.